Stylish Privo unisex protective eyewear looks as smooth as it functions. Half frame design bridges Euro style and comfort with soft tips and temples, a gentle nose bridge, and a sturdy polycarbonate lens that absorbs 99.9 percent ultraviolet light. Anti fog coating allows all day, indoor or outdoor use. 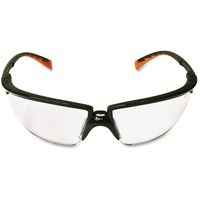 Recommended for assembly, cleaning, electrical, facility maintenance, grinding, machine operations, painting and sanding, these safety glasses help protect your eyes from impact and ultraviolet light. Safety glasses meet the High Impact Requirements of ANSI Z87.1 2003.